Life cycle: This insect produces one generation each year and hibernates as a mature larva. Its only in the adult stage for two months. 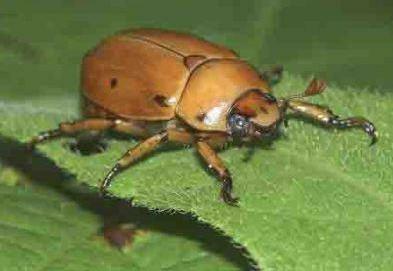 Physical Description: This 1” long, light brown, shiny beetle has 6 black spots on the wings. The larva is a large white grubs that prefer well-rotted wood matter. Feeding characteristics: The adults feed on grape leaves and, if numerous, may cause damage. Controls: If the number of infested plants is small, hand pick the insects.